Don't let jet lag interfere with the enjoyment of your holiday or affect your productivity on a business trip. Order your customized Stop Jet Lag plan today. It's quick. Easy. And at $45.00, it's an incredible value for the money. You have nothing to lose with our 100% money-back satisfaction guarantee. I want to Stop Jet Lag now. 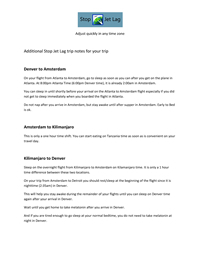 Use this secure Stop Jet Lag order form to enter the flights for your trip. Leaving soon? Expedited service is available for delivery of your Stop Jet Lag Plan. 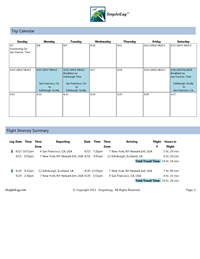 Use this secure Stop Jet Lag order form to retrieve your flights from TripIt. "I cannot recommend it enough. It's a great program and really works! I've travelled a lot and I've never experienced a lack of jet lag like this." Your StopJetLag Plan consists of three parts that address the specific jet lag causing issues on your trip. Your StopJetLag Plan Agenda is the key to when you should follow the scientifically based timing for the major influences on jet lag. You should read this before your trip and it is best to take a printed copy of your StopJetLag Plan with you on your trip. Your StopJetLag Trip Notes are written up when your Plan is created and reviewed to help you understand the nuances that apply to your trip. You can also have these notes read to you in the StopJetLag app. 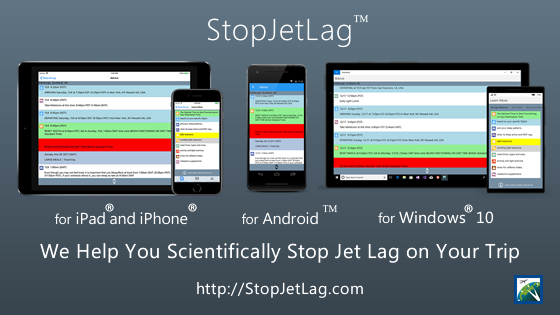 The StopJetLag Mobile App can keep you notified about the best times for the major influences while you are traveling. No internet is required after you initially retrieve your StopJetLag Plan info to receive these notifications.